Without further ado, I am most pleased to introduce the lovely and talented (and very brave!) Belle Maurice! None. Cuts down on laundry. Depends on my mood. Sometimes a tall skinny man, sometimes a small curvy woman, lucky for me I have a prolific imagination. I depends on the speaker. I once met a very hot Hispanic American professional baseball player on a rainy night in a Mexican restaurant in Seoul, South Korea. His English was very tempting. Front seat of a pick up truck in a church parking lot. I’m probably going to Hell for that and the gearshift was no joystick either. A good round of Dirty Scrabble is always fun. Filipino boys (over the age of 18 of course). Oh wait, were you talking about boy toys or the electric kind? My first boyfriend was a huge Styx fan. Dennis DeYoung’s Desert Moon I get nostalgic and a little embarrassed. Honestly, there are so many. It really depends on what you want. Venice is elegant and romantic. The Maldives and West Virginia are beautiful and secluded, perfect for privacy. Kuala Lumpur has an exotic vibrancy. You just have to know what you’re looking for. Rick Savage of Def Leppard, but I suppose you’re going to say that poster didn’t count. How best-selling am I? Because I’ve promised my editor visits to my private island staffed entirely by Filipino cabana boys named Ben. After reading the Walter Farley Black Stallion books I wanted to be a jockey, sadly my hips, my fondness for chocolate and my complete inability to find a racing stable anywhere near where I grew up ended that dream. Butter pecan, preferably London Dairy. Such a pleasure to have you here Miss Belle! Lots of good snarky answers, so where do I start? First, I want to reassure Miss Belle that a poster of a crush DOES count. I had a crush on John Cusack (dunno, don’t get it now, but who knows with teenage hormones?) and I sent him a manly bracelot made out of fishing snapples. It was all the rage back in the mid 80s. And for #1, you are so right – I am for anything that reduces my laundry load. My favorite though was your rite of passage for losing the V. I had a hearty LOL for that, too. So you joined the vehicle club – but in a church parking lot? LOL. I’m sure you aren’t going to Hell for that. I had to pee behind a church on a snowy walk home one New Years Eve in Dublin. There were NO taxis, so my hubby (boyfriend at the time) and I hoofed it the 6 miles home. A bit of a distance but not too intolerable after a few (too many) pints. But holding out for a pee? Almost impossible. 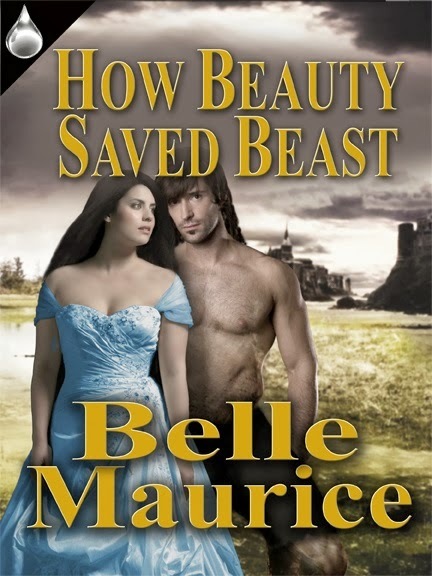 Check out one of Miss Belle’s latest releases, How Beauty Saved the Beast. I’m all for fairy tales!